1.Holling (1992) has claimed that a range of mechanisms, including habitat architecture, may be responsible for discontinuities in body-size distributions across a broad range of spatial and temporal scales. 2.We tested this proposition in the marine benthos by manipulating habitat architecture directly. Specifically, we constructed artificial sediments (using glass beads) of uniform large or small particles, to change interstitial pore diameters at two estuarine sites. 3.A combination of kernel estimation and smoothed bootstrap re-sampling showed that there was a high and varaible degree of modality in body-size (1�modes) in the experimental bead treatments and controls and no obvious evidence for a trough at organism size 0򉣷 mm ESD. 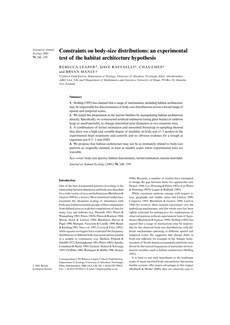 4.We propose that habitat architecture may not be as intimately related to body-size patterns as originally claimed, at least at smaller scales where experimental tests are tractable.